There is increasing evidence that drunk-driving collision risks begin to increase with the start of fall football season. Both college and pro football game days have been associated with an increase in drunk driving accidents and drunk driving arrests in game-day cities. Bars, private parties and the popularity of parking lot and tailgate parties were all cited as reasons. CNN recently reported 800 DUI deaths a year could be prevented with stricter access to alcohol; permissiveness around game days naturally runs counter to that goal. A report by the National Institutes of Health found that binge drinking around holidays and sporting events found college football game days were most associated with student DUI arrest — 35.4 arrests on game day, compared to 12.3 on non-game Saturdays and 11.8 on holidays. According to a New England Journal of Medicine study, last year about 1,500 accidents were caused by drivers under the influence of alcohol following football games in Texas. Nearly half – 45 percent – of football fans in Texas who drink alcohol while they’re watching the game will get behind the wheel to get home. With football comes the return of inclement winter weather and the end-of-year holidays, when the number of serious and fatal drunk driving accidents reaches annual highs. The National Highway Traffic Safety Administration is already rolling out its Don’t Wreck the Holidays campaign, reporting that nearly 4,000 people were killed in December drunk driving crashes over a 5-year period. The fact of the matter is drunk-drivers are often habitual offenders and frequently lack adequate auto insurance to cover victims for losses. Those driving without a license may not have any insurance coverage at all. Even those who do carry coverage, may carry only the minimum’s under Massachusetts auto insurance law, which include $8,000 in personal injury protection (PIP) and Bodily Injury coverage of $20,000 per person/$40,000 per accident. This is typically wholly inadequate in cases of serious or fatal injury, or in accidents where multiple victims are making claims. Consequently, an experienced Massachusetts injury lawyer will look at all potential avenues of recovery in addition to a negligence claim against the at-fault driver and his or her insurance carrier. Dram shop laws vary by state. Most seek to hold licensed liquor establishments civilly responsible for damages resulting from the service of alcohol to underage persons. Some also hold liquor establishments and other business responsible for serving intoxicated adults. Massachusetts law does both. A few states also have dram shop laws that hold social hosts civilly liable, although Massachusetts is not among them. Still, private party hosts may be pursued for damages under theories of general negligence or premises liability in some cases where providing alcohol results in injury. In the Commonwealth, the bar or business establishment may be held responsible under Massachusetts Dram Shop law for service to an intoxicated person or underage person, when such service results in injury to a third-party. Mass Gen. Laws 138 § 69 prohibits establishments from serving intoxicated persons. 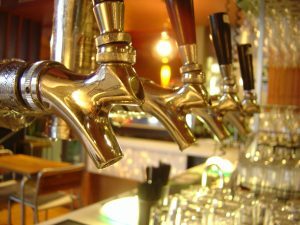 Businesses that serve alcohol in Massachusetts must carry liability insurance coverage of at least $250,000 per person and $500,000 per accident. Most have significantly higher coverage, averaging approximately $1 million in coverage. Businesses or social hosts may also face criminal penalties. Additional Information on Massachusetts Social Host laws is available here. While Massachusetts auto-insurance laws mandate low limits, we are fortunately among the states that require motorists to carry uninsured motorist (UM)/underinsured motorist (UIM) coverage. This coverage must be carried in like amounts to bodily injury coverage, with a minimum of $20,000 per person/$40,000 per occurrence. This coverage is designed to protect you in the event of an accident with an at-fault motorist who lacks auto insurance coverage or does not have enough coverage to fully compensate victims for damages. Making a claim for these benefits with your own insurance carrier is another potential avenue for recovery in the wake of a drunk driving accident. Although you are dealing with your own insurance carrier, these claims are also best handled by an experienced Massachusetts injury lawyer as your insurance carrier will treat you not as a customer, but as any other claimant. If you or someone you love has been injured by a drunk driver, call for a free and confidential appointment at 1-888-367-2900.